Unless you’re on the road regularly on the Big Lap or a similar adventure, you’re probably like most caravan owners – an irregular traveler. The Christmas, Easter and school holidays if you have kids; anytime other than those times if you don’t! And in between those purple patches, the caravan or pop-top you spent so much time researching, buying and setting up for the regular travel you planned, languishes as a refuge for spiders and their next meal in a caravan port, or maybe under a cover somewhere. So when you rediscover it again for the next trip, you’re strangers and need to bond all over again. Find out how to get your van ready to hit the road. 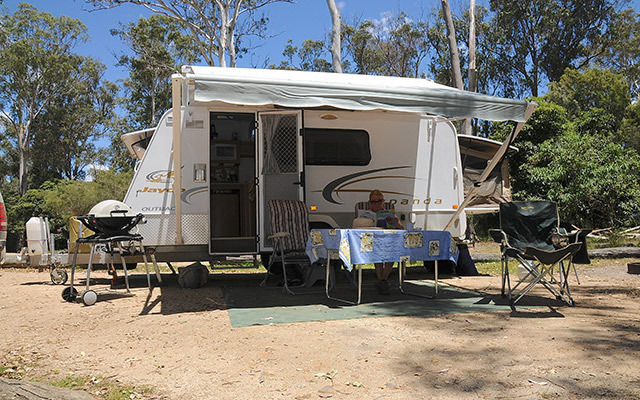 Open up your van, pop-top, or camper trailer after a dormant period and check for ant infestation, spider webs and eggs and – depending where you live in Australia – perhaps worse: evidence of possums, snakes, etc. A spray can of Ant Rid or similar, and the spider equivalent of Agent Orange are your weapons here, along with a brush or broom. While it’s all open, check the fridge. If you’ve left it closed, it’s probably got mould inside. After it’s clean, connect your van to power, freeze some fresh ice blocks (for that drink after you arrive after a long drive when the wine/beer is not cold enough), as most fridges don’t really get cold enough on the first day running on 12V alone. Conversely, look out for fridge doors that open involuntarily (a) because you’ve packed too much in, or (b) because you haven’t shut the door properly or the catch is weak, You can use a simple small rubber ‘bungee’-style strap to ensure the door stays shut over corrugations and (worse) caravan park speed humps. If you have an ensuite, a similar system is ideal for keeping the shower door closed. Flush out the water tank to ensure nothing is growing there and re-fill with drinking water. If you have a water filter or purifying tablets, that’s ideal, but carry at least 20L of drinking water (usually 4L) with in separate containers to ensure you don’t acquire a taste for bore water coffee! Check all of your cupboard latches, folding chairs and tables, etc. and lubricate them. Unsurprisingly, your van becomes an oven when stored and things dry out and stick. Lubricants like WD40 and RP7 are great for loosening up ball hitches, wind-down corner legs, etc. Finally, do a full pre-travel inspection, making sure that all cupboards/doors are locked inside, the folding or drop-down step is retracted, the pop-top (if you have one) and awning latches are secure and the hitch and plugs are properly connected. Planning a big trip? Find caravan parks in Australia on turu.com.au.